Omar Nayef Zayed, a former Palestinian political prisoner and escaped hunger striker whose extradition from Bulgaria Israel demanded in December, was found dead this morning inside the Palestinian embassy in Sofia, Bulgaria, where he had sought refuge. The precise physical cause of Omar’s death is not yet clear, but it is clear that the cause of his death is the Israeli state’s vengeance against a Palestinian struggler committed to live free for himself and for all of his fellow Palestinians. 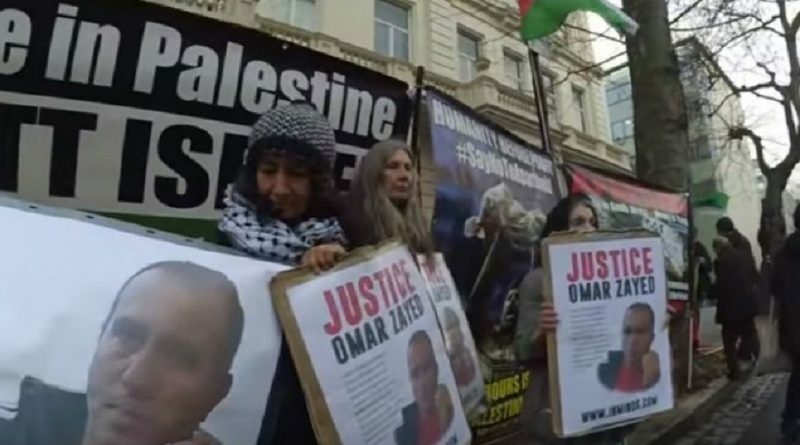 Samidoun Palestinian Prisoner Solidarity Network demands an independent autopsy of Omar’s body and a full investigation by Bulgarian and Palestinian officials into the death of Omar. We demand that all those responsible for the targeting of Omar Nayef Zayed and the taking of his life be held fully accountable. Zayed, 52, was born in Jenin, in Palestine’s West Bank. He was arrested by occupation forces in May 1986 and sentenced to life imprisonment. After a 40 day hunger strike in 1990, he was transferred to a hospital in Bethlehem where he escaped in May, disappeared and left Palestine. In 1994, he traveled to Bulgaria. Omar married a Bulgarian citizen and has Bulgarian children; he runs a Palestinian grocery and is well-known in the Palestinian community of Sofia. Omar’s home was raided on Thursday, 17 December. He was not home and his son was arrested for one day. The Bulgarian prosecutor was quoted in Arabic media calling for his imprisonment and quick extradition to Tel Aviv. Samidoun Palestinian Prisoner Solidarity Network salutes and mourns Omar Nayef Zayed, a former Palestinian political prisoner who struggled all his life for the freedom of Palestine and the Palestinian people. We extend our deepest condolences to the family of Omar Nayef Zayed, in Palestine, in Bulgaria and everywhere, and to the entire movement for the liberation of Palestine, which has had a loving father and husband and a committed struggler for a free Palestine taken away at the hands of those who would see Palestine, and its people, forever imprisoned. We are committed to working in all ways to hold those responsible for his death fully accountable for this vicious crime against the Palestinian people, and to struggle for the freedom – of Palestinian prisoners and of Palestine itself – which Omar Nayef Zayed held so dear. UPDATE/11:44 am/26 February: Bulgarian media and police sources are reporting that Omar was killed by falling from a high story of the building. They have noted that him being pushed is “not excluded.” “Israeli media have been the first to report explicitly that Omar was ‘assassinated.’ This comes as no surprise. They’re simply the most knowledgeable and honest about the workings of their government and its intelligence agencies,” said Joe Catron of Samidoun.